Peak Energy: Bruce Sterling's "The Epic Struggle of the Internet of Things"
Bruce Sterling's "The Epic Struggle of the Internet of Things"
Boing Boing has a post on a new pamphlet from Bruce Sterling on The Internet of Things - Bruce Sterling's "The Epic Struggle of the Internet of Things". It's interesting watching the switch from traditional publishing to self-publishing on the Kindle store and other e-book shops. 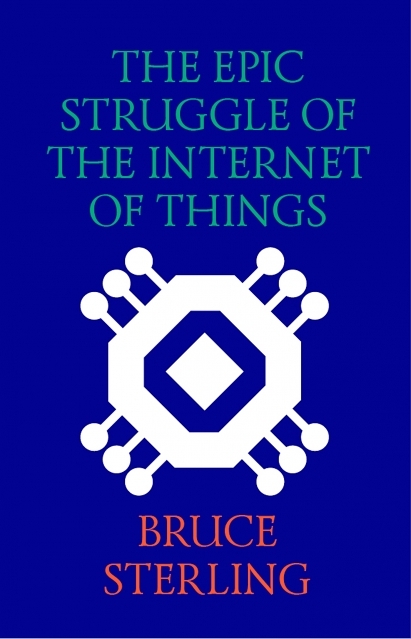 It's also interesting considering Bruce's increasing jaundiced view of "the internet of things" - the first iteration of which he used to promote quite enthusiastically if I recall correctly. It's a new long-form essay in the tradition of Sterling's must-read, groundbreaking 2005 book Shaping Things, a critical perspective on what it means to have a house full of "smart" stuff that answers to giant corporations and the states that exert leverage over them.